NEW ORLEANS – The No. 1 team in the country remained the same for the fourth week in a row and little movement was had by teams at the top of the charts in the latest edition of the NCAA Division I Women’s Indoor Track & Field National Rating Index released by the U.S. Track & Field and Cross Country Coaches Association (USTFCCCA) on Monday. Only two of the top-10 teams experienced some kind of movement while the top-25 saw 13 of 25 teams move around. There looks to be a reason for that though as the indoor season is about to kick into high gear and many teams did not compete with full units this past weekend. The No. 1 spot again went to Arkansas with 195.26 points. The Razorbacks competed at the Charlie Thomas Invitational and focused heavily on their sprints group at the meet. Picking up victories for the program were Kiara Parker in the 60 and 200, Morgan Burks Magee in the 400 and Alexandra Byrnes in the 800. It is the first time a team has held the No. 1 spot for the first four rankings since Oregon remained at the top of the country for all eight weeks of the 2017 season, one that ended in a national title for the Ducks. The Razorbacks host a stacked field at its Tyson Invitational in Fayetteville this weekend. Holding in the No. 2 spot was Southern California after it picked up 128.84 points. The Trojans were off from competition this past weekend and will return to the track at the Tyson Invitational. Slotting in behind them was No. 3 Texas A&M after it registered 107.23 points. The Aggies won its Charlie Thomas Invitational over the weekend and had a number of successful performances. Laura Fairchild won the mile, while Kelsie Warren took first in the 5000. Ciynamon Stevenson also earned the top spot in the triple jump at the meet. Texas A&M travels to Clemson, South Carolina, this weekend for the Tiger Paw Invitational. Remaining in the No. 4 position was Florida with 94.29 points. The Gators, like many top programs in the nation, will test their might at the Tyson Invitational. Concluding the top-5 after a two-spot improvement was No. 5 Florida State with 94.28 points. The Seminoles were off from competition this past week and will be back in action at the Tiger Paw Invite. Making up the rest of the top-10 was No. 6 Oregon (91.46 points), No. 7 Texas (89.18), No. 8 New Mexico (88.33), No. 9 Georgia (85.50) and No. 10 Kentucky (81.99). The program that saw the biggest improvement in the top-25 was No. 15 Iowa which shot up 22 spots after the team had solid performances from its two group of athletes who competed at the Frank Sevigne Invitational and the Meyo Invitational in Lincoln, Nebraska, and South Bend, Indiana, this weekend. It is the best the Hawkeyes have been ranked in program history, topping its old high of 18th achieved during the 2008 season. The largest gains in the nation belonged to No. 83 Tulane (up 45 spots), No. 81 Wofford (up 43), No. 44 Norfolk State (up 39) and No. 48 San Diego State (up 31). Four previously unranked teams also joined the index this week in No. 109 South Alabama, No. 112 UCF, No. 119 Nevada and No. 120 Northern Colorado. 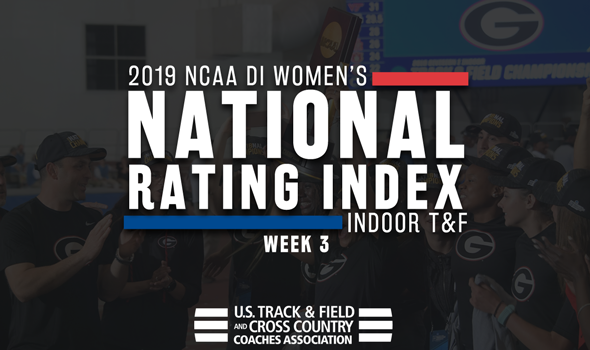 The next DI National Track & Field Rating Index will be released on Monday, February 11. This is the final week that marks from previous seasons will be used to tabulate the TFRI. Starting next week, only marks from the current season will be used, so stay tuned for that! MEN | WOMEN Mar. 9-10: NCAA DI Championships Birmingham, Ala.